Professor Margherita Guarducci is a distinguished Italian archaeologist whose impressive scientific works upon the epigraphy of the excavations beneath St. Peter's in Rome have created wide interest and comment. This book, of a popular character, places the reader in possession of all that concerns the coming of St. Peter to Rome, his martyrdom, and his burial in the Vatican. Several pages also (chapter V) give the conclusions of the author's epigraphical studies, in which she demonstrated that before St. Peter's was built, Christians sought out the Apostle's tomb in the Vatican Cemetery and covered neighboring walls with prayers, invocations and names. On one of these walls (Wall G) Professor Guarducci has discovered a religious "cryptography" by which the faithful offered prayers for the eternal life of their dead and, at the same time, expressed their firm Christian faith. Her argument is illustrated by many photographs of the actual inscriptions. To the general reader, perhaps the most interesting portion of this book will be the author's scholarly account of the pre-Christian and the post-Christian history of that portion of the Vatican Hill upon which St. Peter's stands, and her description of the scientific investigation of the space beneath the high altar, the traditional burial place of St. Peter, which was undertaken with the authority of the late Pope, Pius XII. Professor Guarducci notes the disinclination to explore this site felt by all former ages. "An irresistible prudence, almost an unconquered fear, prevented a thorough investigation of the terrain," she writes. "The fear of finding something down there which would contradict or modify the tradition dear to the faithful overcame the desire to appease a burning curiosity." The satisfaction of this "burning curiosity" has, it is true, modified the popular conception of the Apostle's tomb, but it has not contradicted the tradition. A visit to the street of tombs in the ancient Roman cemetery upon which St. Peter's is built (it is thirty feet beneath the nave and the high altar), is the most impressive and memorable experience that can fall to the lot of anyone in Rome. The excavations are not open to the public, and entry will always be restricted to small groups of scholars, historians and archaeologists. The visitor descends a flight of steps at the Arco delle Campane entrance (on the extreme left as you face St. Peter's) and these lead beneath the Vatican Grottoes into a dusty silent Roman street which might be in Herculaneum or Pompeii. Sombre and dignified brick doorways, standing on each side of the road, afford entry into painted tomb-chambers where the dead still lie in sarcophagi or in urn burials. This cemetery, which was used by both pagans and Christians, was once open to the sun and air, but has known no daylight since Constantine the Great built the basilica upon it sixteen centuries ago. Now, by the stark light of unshaded electric bulbs, and beneath a roof of iron and steel, the visitor explores this street, reading the names of those buried there so long ago, until he comes to that space below the high altar which archaeologists can recognize as the tomb, or the memorial, of St. Peter. To the layman, it is a scene of some confusion where walls of different dates, and marble coffins embedded in masonry, are crowded together side by side, and only the trained eye can detect the essential pattern. The visitor can only reflect with awe that he is standing in a place venerated by Christians since the first century. The visible evidence of such veneration is the theme of this fascinating book. In 333, indeed, there was already a monument on the Vatican Hill, built almost twenty years earlier by the Emperor Constantine to enclose the little chapel over the Apostle's tomb. Above the monument rose - although it had not yet been finished - the basilica in which the same emperor had decided to glorify the first vicar of Christ. Today the basilica of Constantine has disappeared. The taste of the Renaissance, avid for classic lines and grandiose forms, chose to tear it down and to substitute another, equally notable building - the splendid church by Bramante crowned with the lofty dome by Michelangelo. On this new basilica each passing century has left its mark. The seventeenth and eighteenth century created noble works inspired by nostalgic love of ancient arts; and our own century has accomplished, and continues to undertake, notable works of restoration and decoration. But if the course of centuries and innumerable changes have radically transformed the appearance of the basilica, the words of Eusebius remain - we might say - up to date. Christians still come to the shrine of Peter and linger there in prayer. They come from all parts of the world; for near and far, often from very far (the modern world is so much larger than that known to Eusebius! ); they come by land, sea and air. They come dressed in the most varied fashions, speaking many foreign languages. What are the thoughts that stir in their hearts? Probably they might run like this: "Peter is the Galilean fisherman who Christ chose among the disciples to be His vicar on earth; Peter came to Rome to preach the Gospel; there he died, a martyr, crucified like his Master, during the persecution of Nero, and he was buried on the Vatican Hill. Above his tomb rises the greatest church in Christendom; nearby the Pontiff, successor to Peter and custodian of divine truth, has his See. The tomb of the Apostle is therefore the solid rock on which the Church is founded; it is the symbol of its unity and of its strength against the forces of evil; it is a consolation for the faithful aspiring to the heavenly kingdom, for which Peter, through the will of Christ, holds the keys." The thoughts of the Christians who crowd reverently into the Basilica of St. Peter agree with the age-old tradition of the Church. But this serene and certain faith has not been shared by all in the past and is not universally held today. Men have tried many times , and they are still trying, to strike the Roman tradition at its root, denying the martyrdom and even the presence of Peter in Rome. The first attacks were launched in the thirteenth century, at the height of the Middle Ages, by the Waldensian sect. Stubbornly maintaining that it was necessary to reject any traditions not found in the Bible, they denied the tradition of St. Peter's journey to Rome and his martyrdom there. We shall see in later pages that this judgment is incorrect, since Holy Scripture offers us, in the first Epistle of St. Peter himself, a very significant clue supporting the Roman tradition. But the seeds of doubt planted by the Waldensians bore their fruit; not immediately, but - as happens often in history - in later centuries. We cannot be sure form what source in Rome Luther obtained this information, but there is clearly some exaggeration involved, for in the sixteenth century the great majority of Romans accepted without question the common and very old tradition that the remains of the two Apostles lay within the two basilicas located, respectively, in the Vatican and on the Via Ostiense. In the seventeenth century and, again, in the nineteenth, Protestant attacks on the Roman tradition became more violent, and they continue today. The chief contemporary representative of this tendency is Karl Heussi, who has published more than ten writings of varied importance to prove that St. Peter never came to Rome and cannot be buried there. Heussi's most recent work, entitled A Critical Look at the Roman Tradition of Peter,3 was published in 1955. But it cannot be said that all Protestant scholars have united against the Roman tradition. Some, indeed, have welcomed it rather liberally and strenuously defended it. It is sufficient to mention the well-known names of Adolph von Harnack, John Lietzmann, and Oscar Cullman. Lietzmann, who died in 1942, succeeded in refuting some of Heussi's writings in his time,4 while more recently another German scholar, Konrad Aland, has answered Heussi's later writings. To answer these questions, which have occurred to many truth-seeking minds, there is only one method: to examine calmly the documents, that is - in this case - the literary sources and the results of archaeological investigations. The ancient writers have given us important information on the martyrdom and the burial of Peter. The researches and the excavations undertaken up to now in the Vatican region, and particularly under and around the basilica, have added the weight of their testimony to this ancient information. There are also the excavations completed under and around the Church of St. Sebastian on the Appian Way, and we must consider these to decide whether it is possible - as some maintain - that the remains of St. Peter were kept for some time, with those of St. Paul, in that location. In writing these pages, I propose to summarize what is known for certain and to clarify as much as possible what is obscure, seeking to combine the most scrupulous scientific accuracy with simplicity of expression. This is particularly necessary since my words are directed specially to those who, without being historians or archaeologists or professional scholars, wish to have precise information on this problem which has aroused and continues to arouse such intense and widespread interest. Fig. 1. 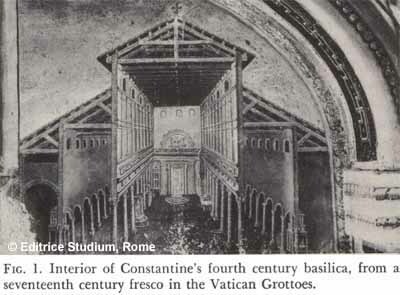 Interior of Constantine's fourth century basilica, from a seventeenth century fresco in the Vatican Grottoes. Fig. 2. St. Peter placed under arrest. Detail from a sarcophagus datable about 325 A.D., (from the excavations under St. Peter's). The monogram of Christ can be seen on the scroll of the law which Peter holds in his hand. Fig. 3. St. Peter in the act of preaching. A mosaic which was formerly in the chapel of John VII (705-707), Vatican Grottoes. Fig. 4. St Peter with the keys. Mosaic which was formerly on the tomb of the Emperor Otto II (died 938). The Apostle is shown next to the seated Christ, who embraces him with His left arm. The image of St. Paul is on the other side of the Redeemer. From the Vatican Grottoes. Fig. 6. The obelisk from the arena of Gaius and Nero, in front of the round Church of St. Andrew. Drawing by the Netherlands artist Martin Van Heemskerk (1498-1574). Fig. 7. Base from the sanctuary of the Phrygian deities (fourth century A.D.). Vatican Grottoes. On the two panels of the relief can be seen a bull, flutes, a pine tree from which a drum and a syrinx hang, two crossed torches and other objects related to the cult. Fig. 8. Monument of Nunnius, Ma and Crescens (first century A.D.) Excavations in the Vatican parking lot. Fig. 9. The Meta Romuli and the Terebintus, panel of the bronze door executed for St. Peter's Basilica by Antonio Averlino, called Philaretes (from 1433 to 1445). The scene shows the crucifixion of St. Peter before the eyes of Nero. At the bottom can be seen (left to right): the Meta Romuli (before the goddess Roma sits), Hadrian's tomb (now Castel Sant' Angelo), and the Terebintus. Fig. 10. Tomb inscription set up by freedmen of the Emperor Domitian (83-96). On the south side of the Church of St. Stephen of the Abyssinians. The name of Domitian is found on lines 2 ff. : Imp(eratoris) Caesaris (Domiti) ani Aug(usti) Germanici. Fig. 11. Seal from the time of Vespasian (69-79). Excavations of the Vatican necropolis. The seal reads: Stat(ius) Marcius Demetrius f(ecit). Fig. 12. View of the tomb of the Valerii during the excavation work. Excavations of the Vatican cemetery. Fig. 14. Marble tablet above the entrance to the tomb of the Valerii (second half of the second century A.D.). Excavations of the Vatican necropolis. The name of C. Valerius Herma, owner of the tomb, can be read clearly. Fig. 15. Mosaic picture showing the killing of Pentheus by the Maenads (end of the second century A.D.). Excavations of the Vatican necropolis. The scene shows the Maenads and a panther attacking the pine tree on which Pentheus, a king of Thebes hostile to Dionysus, has taken refuge. Fig. 16. Interior of the tomb of the Cetennii (middle of the second century A.D.). Excavations of the Vatican necropolis. Fig. 17. Sarcophagus of Ostoria chelidon (third century A.D.). Excavations of the Vatican necropolis. Fig. 18. Spirits with poppies, a plaster ornament in an arch of the tomb of the Valerii (second half of the second century). Excavations of the Vatican necropolis. Fig. 19. Mosaic depicting the abduction of Proserpina (third century A.D.). Excavations of the Vatican necropolis. Fig. 20. Sarcophagus showing the triumph of Dionysus (second century A.D.). Excavations of the Vatican necropolis. Fig. 21. Christian epitaph of Aemilia Gorgonia (third century A.D.). Excavations of the Vatican necropolis. At left, the deceased is shown drawing the water of life. Above the picture is written: anima dulcis Gorgonia. Fig. 22. Mosaic showing Christ-the-sun on the ceiling of the tomb of the Julii (first half of the third century A.D.). Excavations of the Vatican necropolis. Fig. 23. The stairway to the Confession under the Papal Altar with the bronze columns which support the canopy (not shown in the photograph). The back of Pope Pius VI is shown as he kneels facing the rear wall of the Confession. Fig. 24. A view of the clivus behind the Red Wall. Excavations of the Vatican necropolis. At left are the remains of Tombs R and R1: at the rear, the stairs; at right, the brick facing of Tomb S and part of the back surface of the Red Wall. The sarcophagus decorated with curved lines and reliefs sank down from the level of Constantine's basilica. Fig. 25. Diagram of area under the Papal Altar. Fig. 26. Reconstruction of the shrine in the Red Wall. Fig. 27. Human bones discovered under the foundations of the Red Wall. Excavations of the Vatican necropolis. Fig. 28. One of the small marble columns of the shrine (about 160 A.D.). Excavations of the Vatican necropolis. Fig. 29. Epitaph of Renatus. Rome, Lateran Museum (from the cemetery of Sant 'Ermete.). Fig. 33. Epitaph of Ursa. Urbino, Duke's Palace (taken from Rome). Fig. 36. Christian epitaph. Museum of Naples (taken from Rome). Fig. 37. Christian seal. Rome, cemetery of St. Agnes. Fig. 43. The heads of Christ and Peter in the tomb of the Valerii (end of the third-beginning of the fourth century A.D.). Excavations of the Vatican necropolis (photograph taken during the excavation). To the left of Peter's head is written PETRV, to the right, S ROGA; the rest of the epigraph was still covered with dirt. Fig. 44. Prayer to St. Peter in the tomb of the Valerii (end of the third, beginning of the fourth century A.D.). Excavations of the Vatican necropolis. Fig. 45. A mausoleum of the second burial place under the Church of St. Sebastian (second half of the second century A.D.). Fig. 47. Graffiti on the walls of the triclia under the Church of St. Sebastian (second half of the third century A.D.). The graffito Paule ed Petre petite pro Victore ("Paul and Peter, pray for Victor") is quite visible. Fig. 48. The Apostles Peter (right) and Paul, in a medallion found in the cemetery of Domitilla (beginning of the third century A.D.) Sacred Museum of the Vatican Library. Fig. 49. The Apostles Peter and Paul on either side of a wreath bearing the monogram of Christ. Gilded glass, from the fourth century A.D. Fig. 50. Tombstone of Pope Anteros (died 236 A.D.) Rome, cemetery of St. Callistus, crypt of the Popes. After the Greek name (Anteros) are written the first three letters of the work (episkopos = "bishop"). This was the title given to the early Popes. PLATE III. The area of the Apostolic Memorial. PLATES IV to XIII. 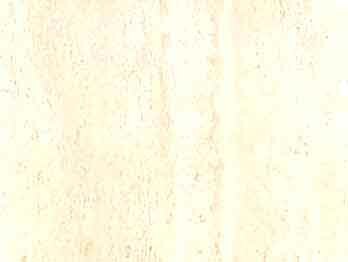 Detail of the graffiti on Wall G* (end of the third century and beginning of the fourth century). * In the Italian text "G" is shown as a lower case letter. Ed. Rome was the site of Peter's Martyrdom. This is the statement repeated unanimously by many ancient authors; no author, we might add, asserts that he suffered martyrdom anywhere else. It is easy to see that this very eloquently supports the Roman tradition. Indeed, if this tradition had not had very solid foundations, it is probable that some voice would have been raised to point out in another city the place where Peter gave, through martyrdom, the supreme testimony to the Faith. Opportunities certainly would not have been overlooked. In the second century, for example, the Christian communities of Ephesus and other places in Asia Minor, which had begun to show feelings of rivalry toward the Church of Rome, would have been quite happy if they had been able to deny Rome's boast of having within its walls the tomb of the first vicar of Christ. But no one, so far as we can determine, ever attempted - then or later - to dispute this distinction claimed by Rome. So far as St. Peter's journey to Rome and his stay there are concerned, we must admit that in the Epistles of St. Paul, no explicit indications can be found. Indeed, in the famous Epistle to the Romans, written between 57 and 58 A.D., Paul does not mention the name of Peter among those to whom he sends greetings. Similarly, in the two Epistles which he wrote from Rome, to the Collosians (between 60 and 62 A.D.?) and to Timothy (in 62 or shortly thereafter), Peter is not named among those who, through Paul, send their greetings to distant brethren. Some scholars have attempted to deduce from this that, at least on these three occasions, Peter was not in Rome. This is possible; on the other hand, we cannot completely exclude the possibility that Peter's name was omitted on purpose for reasons of prudence or for other motives unknown to us. In addition, it is not improbable that when St. Paul, in the Epistle to the Romans,1 refers to the work of Christian evangelism already undertaken in Rome "by others" he had St. Peter in mind. Certainly it is hard to believe that Peter, who had taken upon himself the task of preaching to the Jews, would have neglected to go very promptly to Rome, where there was, at that time, a very large Jewish colony. Nor is explicit mention of Peter's journey to Rome found in the Acts of the Apostles. But we must consider that the Acts end abruptly with the arrival of Paul in Rome and that the martyrdom of the two Apostles falls outside the scope of the work, at least in the form in which it has come down to us. On the other hand, there is very clear testimony of Peter's stay in Rome in the first Epistle - certainly authentic - of Peter himself. At the end of this Epistle, written, apparently, in the year 64 to the Christian communities of Asia Minor, the Apostle sends the following words to the distant faithful: "The community of the elect in Babylon sends you greetings; so does my son, Mark,"2 Mark is usually identified with the Evangelist as Peter's spiritual son; and Babylon is without doubt the place from which the Apostle is writing. But which Babylon is it? It would be absurd to think of the Babylon in Mesopotamia, since no mention has come down to us of a journey by Peter into that remote region; and in addition it is known that the Mesopotamian Babylon was practically abandoned by the Jews about the middle of the first century.3 It would be even more far-fetched to identify Peter's Babylon with an obscure Babylon in Egypt, mentioned by the geographer Strabo and by others as a military outpost.4 The Protestant scholar Karl Heussi, who denies with such energy that Peter ever visited Rome, finds in the Babylon of the Petrine Epistle a metaphorical concept more or less equivalent to that of the word Diaspora found at the beginning of the Epistle. In other words, Babylon would be the whole group of "faithful without a homeland" who aspire to the better life promised by Christ. But the use of "Babylon" in this sense is not attested in any document, and besides it is quite clear that the Apostle refers here to a true and particular city. Now, it is a well-known fact that in the first centuries of Christian era there was a widespread custom of applying the name of Babylon to Rome. This custom was part of a massive movement of hostility toward Rome, a movement which had originated and continued to receive its principal momentum from the Jewish community.5 The radical difference between the Roman mentality and that of the Jews had aroused in the latter a dull resentment which later, after the destruction of Jerusalem by order of the Emperor Titus in the year 70, became an implacable hatred. In harmony with this attitude, the Jews had given Rome the name of Babylon, which assumed, for them, a profound significance. Babylon was the city through whose crime the Jews had suffered so much, just as they were suffering now through the crimes of Rome; Babylon was the wicked, corrupt city, as wicked and corrupt as Rome, in that era, appeared to them; Babylon had been destroyed, becoming almost a symbol of human power crumbled to dust, and they wished exactly the same fate to fall on Rome. Therefore it is not strange that Peter, without giving the name "Babylon" an accent of hatred, still followed a usage long very common among Jews and among Orientals in general. This interpretation has been adopted by many Christian authors, some of them quite ancient. Now if "Babylon" is equivalent to "Rome," it follows that Peter dictated his first Epistle at Rome, foreseeing the terrible tests that he himself and his flock would have to face and trying to stir up in their souls their faith in the promises of Christ. On the fact of Peter's martyrdom, we have certain information. In St. John's Gospel, written, apparently, near the end of the first century, is found the phrase by Christ to Peter, after exhorting him to feed His sheep:6 "Amen, amen I say unto you, when you were younger you would gird yourself and walk where you wished to go; but whey you have grown old you will stretch out your hands and another will gird you and take you where you do not wish to go." And St. John adds: "He told him this to show the death with which he would glorify God. And when He had said this, He told him, 'Follow me'"
The expression "stretch out the hands," common in the time of St. John, had the special meaning of "die on the cross." In addition, the invitation "Follow me," which Christ gave to Peter after predicting his martyrdom, is quite significant. Christ seems to mean that Peter must follow Him even in his manner of death; dying, like the Master, on the cross. Another clear indication of the Apostle's martyrdom, is found in Peter's second Epistle, in the words: "knowing that soon I must leave my mortal body, as Our Lord Jesus Christ revealed to me. "7 The authenticity of this Epistle is not universally recognized; but even those who deny it admit that it is a very ancient text, difficult to date after about 150 A.D. The above-mentioned sections of the New Testament clearly refer to the martyrdom of Peter, without indicating precisely where it took place; but there are other documents from which it is apparent that it happened in Rome. On this point, many scholars have quoted two famous passages: one, taken from the first Epistle to the Corinthians of St. Clement of Rome; the other, from the Epistle to the Romans of St. Ignatius of Antioch. St. Clement was Bishop of Rome at the end of the first and the beginning of the second century (approximately 92-101 A.D.). This is a time so close to that in which the Apostles Peter and Paul preached and died that he may have known them personally. In addition, he was a native of Rome and, as a Roman, must have been better informed than others on things that had happened in the City. He seems to have written the first Epistle to the Corinthians in the year 96, when the faithful in Rome had hardly finished with the fierce persecutions by the Emperor Domitian, and the memory of these dramatic events must have been very strong in the mind of St. Clement. The purpose of the Epistle was to smooth out the discords which had appeared among the Christians of Corinth and which, if they were not quickly subdued, might have brought on very serious evils. To Achieve his purpose, St. Clement tries to put the Corinthians on guard against jealousy, envy and discord, showing them with ancient and contemporary examples that these fatal passions bring death to families and to society. After speaking of Cain and Abel, or Esau and Jacob and other famous names from the Old Testament, he comes to the eloquent and terrifying cases of his own generation and recalls in particular those heroes of the Church (he call them "pillars") who were persecuted and killed because of jealousy and envy. "Let us consider," he writes, "our good Apostles, Peter and Paul, who suffered not one but many trials through unjust jealousy, and thus, having given testimony, went to the deserved place of glory. Because of jealousy and discord, Paul bore the palm of suffering … and having given his testimony before the rulers, left the world and was taken up to the holy place." Without doubt, St. Clement was referring to the victims of the persecution of Nero. This is clearly demonstrated by consulting a famous passage in the Annals of Tacitus,9 where the great Roman historian recalls the tragic events of the burning of Rome (July 19, 64 A.D.) and of the persecution launched by Nero against the Christians to place on them the blame for the fire that he himself had arranged. Tacitus speaks of the great number of the faithful whom Nero had imprisoned and killed with the most cruel tortures, during horrible spectacles staged in the Vatican gardens and particularly in the arena. Some of the words he uses correspond exactly to the Greek words in the Epistle of St. Clement. Now, if St. Clement associates the memory of Peter and Paul with that of the victims of Nero's persecution, this means, in all probability, that the Apostles were victims of the same persecution. The fact of their martyrdom is confirmed by other particulars in St. Clement's text. Thus, the Greek verb (martyrein) used by St. Clement to indicate the "testimony" which they gave to Christ, signifies usually, in Christian texts, testimony given with blood, i.e., with martyrdom. Two other expressions, "place of glory" ( - topos tes doxes) and "holy place" ( - hagios topos) used by St. Clement to indicate the place where the Apostles received the reward of their heroic virtue, refer perfectly to those who have sealed with martyrdom their faith in Christ. It is also very significant that St. Clement repeatedly deplores the jealousy and envy found among followers of the same Christian religion. This insistence recalls to our memory the sorrowful words with which St. Paul refers to "false brethren"10 and condemns "jealousy" and "discord" among Christians who preach the same Gospel.11 There is also confirmation from Tacitus who, in the famous passage on Nero's persecution tells us precisely that the great number of Christians killed in this persecution were captured as a result of denunciations by a few who had been arrested first. All these indications concur to show that St. Clement considered Peter and Paul the most outstanding martyrs of Nero's persecution, drawn to death by the jealousy and discord of their own brethren.